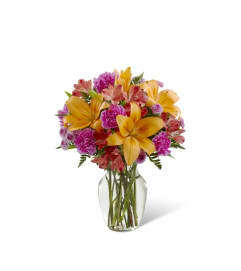 The FTD® Sunlit Blooms™ Bouquet will bring warmth and brilliant color into their day with its sweet and charming look. 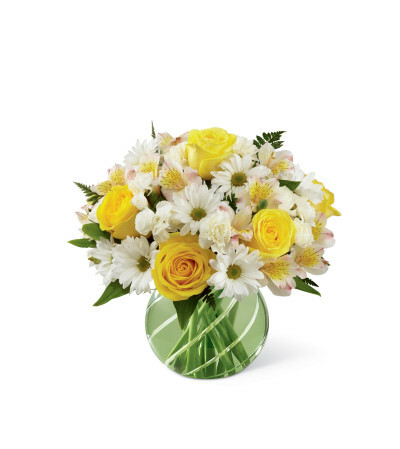 Incredible yellow roses, Rosario Peruvian lilies, white carnations, white traditional daisies and lush greens are brought together to create a cheerful flower arrangement. 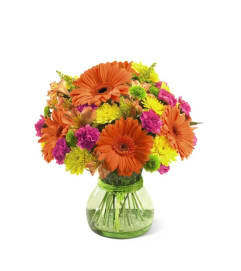 Presented in a green glass bubble bowl vase featuring a cut glass design, this mixed flower arrangement will bring the excitement and renewing feeling of a sunlit day straight to their door to help celebrate a birthday, extend your get well wishes, or convey your most heartfelt thanks and gratitude.